Yesterday, after the Steelers beat the Browns (and the Giants beat the Lions AND the Ravens lost), we opened a bottle of Coppola Rosso (a blend of Syrah, Cabernet Sauvignon, and Zinfandel) to celebrate victory and started making dinner: Chicken Cacciatore. This recipe is from our Cover & Bake cookbook (from Cook's Illustrated). 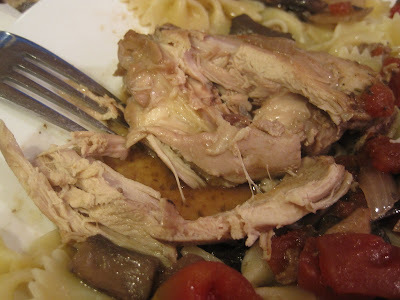 As it turns out, last Friday was National Chicken Cacciatore Day. Seriously. I remember my mom making chicken cacciatore when I was a young girl. It was one of my dad's favorite dishes. My mom always made it in an electric skillet. I remember it was cooked chicken in a tomato sauce filled with chopped green peppers that my dad would always pick out because he likes the flavor they give to a sauce but not the actual peppers. 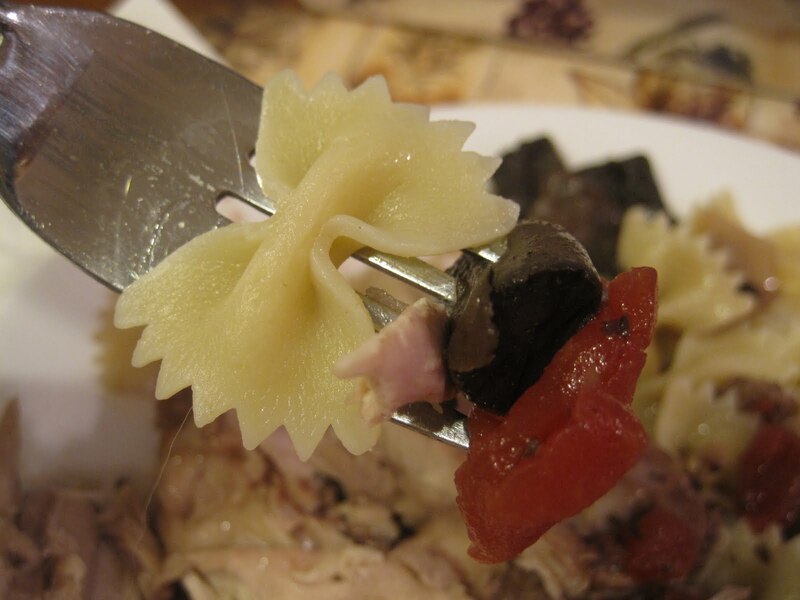 I don't think it was a true cacciatore! I think it was too tomato pasty and it wasn't really braised chicken. Cacciatore means 'hunter-style' in Italian and originally referred to a simple method of cooking fresh-killed game. 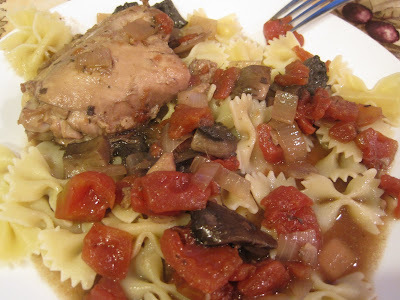 Chicken cacciatore is chicken prepared 'hunter-style' with tomatoes, onions, garlic, spices, mushrooms, and often peppers. Most cacciatore dishes I've seen in restaurants or recipes I've seen in magazines & cookbooks seem to always include peppers. I like peppers, but only in small quantities. The older I get, the more peppers seem to give me heartburn/indigestion. 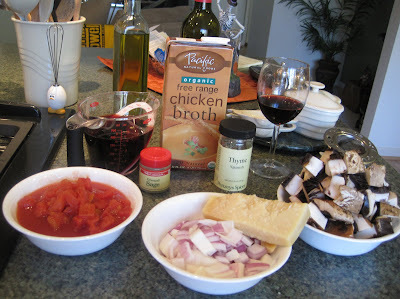 So I was never too excited about trying my hand at chicken cacciatore. But this recipe did not call for peppers. It's officially called 'Chicken Cacciatore with Portobello & Sage.' It's easy to make but does require some time. 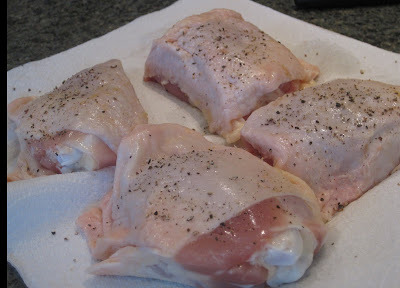 We gathered our ingredients and unwrapped our package of chicken thighs and sprinkled them with salt & pepper. There were 8 thighs. We browned them, skin side down first, in olive oil. 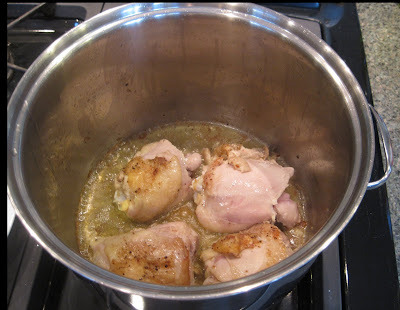 The chicken thighs are browned with the skin on so that the rendered fat & juice from the skin caramelizes on the pan bottom and then when the pan is deglazed, they contribute to the flavor of the sauce. The skin also protects the actual meat from directly touching the heat and developing a fibrous crust. 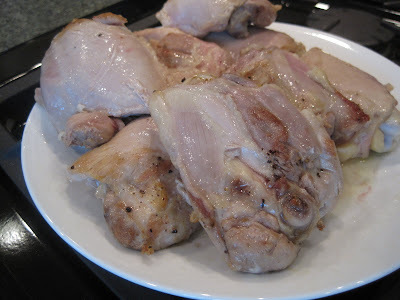 After the chicken is browned, the skin is removed. The Cook's Illustrated folks found that if the skin was left on, the sauce became too greasy and the skin became unappetizingly flabby. Here's our browned chicken thighs, skin removed: After all the chicken is browned, all but 1 tablespoon of fat is removed from the pot. The onions and mushrooms are added to the remaining fat and sauteed until the moisture evaporates. Then a bit of flour is stirred in, followed by the wine to deglaze the pot. We used a wooden spoon to scrape up the bits of brown on the bottom of the pot. 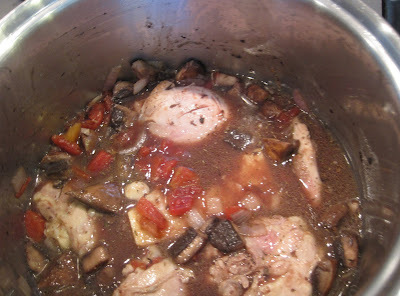 Next, we added the chicken thighs, chicken broth, a can of drained chopped tomatoes, thyme, and parmesan rind. After everything came to a simmer, the dutch oven (or in our case, since we don't have a dutch oven, a large stock pot) was placed in a 300 degree oven for about 1.25 hours. Meanwhile, SP made spaghetti squash for with his cacciatore and I made bow tie pasta for with mine. The recipe says the chicken is done when it offers no resistance when poked with the tip of a paring knife but is still clinging to the bones. 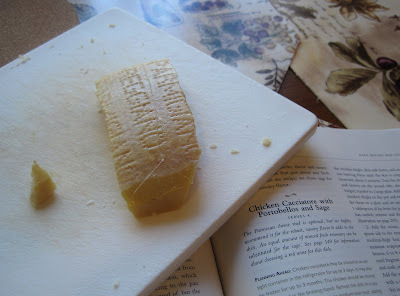 After removing the pot from the oven, we discarded the parmesan rind, stirred in the sage, and sat down to enjoy it. The chicken was very moist and flavorful, It didn't fall away from the bone with just a fork, but it easily pulled away with a knife and fork. It wasn't dry or tough. 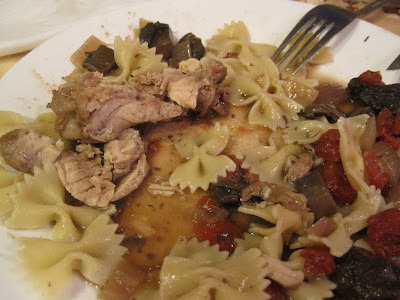 Here's a closer view of the chicken: Here's a photo of a forkful with all the components: pasta, chicken, mushroom, and tomato: We both thought our sauce was a little too watery, and we surmised as we ate that maybe we hadn't sauteed the onions and mushrooms long enough to fully evaporate the moisture. However, as I look at the photos today and think about things, I notice that in the gathered ingredients photo, it looks like the tomatoes are sitting in a bowl in their juices. I'm willing to bet the tomatoes and their juices got dumped in the pot. We forgot to drain the tomatoes. Oops. It wasn't a 'fatal' mistake as this dish seemed balanced and flavorful to us. It wasn't too tomato-y. I think we were just over-analyzing our sauce because the Cook's Illustrated authors went into detail about how they arrived at this particular sauce, which they found to be not a pasty tomato sauce, not a thick gravy sauce, not a sauce in which the chicken swam, and not a sauce reminiscent of Spackle. Next time we'll be more careful and see how it turns out with drained tomatoes! This dish is so tasty you'll be wearing it by the end of the meal: Yes. 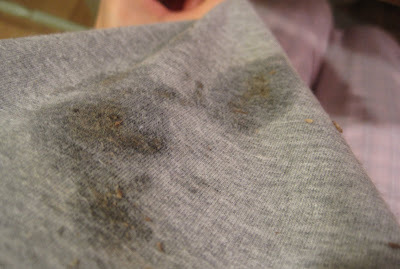 That's my shirt. Sometimes, I really need a bib. Sometimes, it's just that tasty and I just can't seem to get it in my mouth fast enough. Or at all. Wow! I'm impressed! Thanks for sharing! I'll definitely check in regularly! This looks sooo good. I am definitely going to make this!